The most common problem that expansive soil can result in slab on grade foundation is expansion pressure exerted to slab and resulting impacts of this expansion pressure are discussed in many posts of this blog. Here we will try to find solution for such problem. Structural slabs are provided with extra thickness and with the addition of steel reinforcement, it resists expansion pressure. 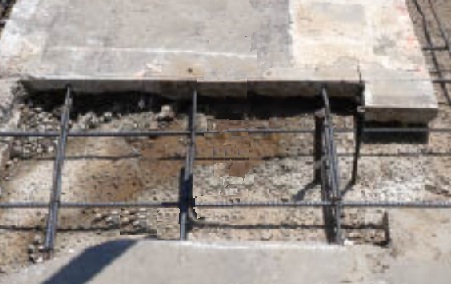 In this process of foundation repair, the existing concrete slab are dismantled and structural slab are provided with reinforcement spacing generally satisfying shrinkage and temperature requirement of reinforced concrete through both directions. Some may have seen application of dowels. This situation arises when existing load bearing foundation cannot be removed. To achieve this purpose, existing thin slab just above the load bearing foundation are isolated by cutting remaining slab by concrete saw. The reinforcement from new structural slab is doweled to the existing slab. Required holes are drilled in the vertical face of existing slab and epoxy-glued rebar are passed through the hole. The size and depth of hole are specified by the manufacturer depending on size of bar. It is usual to remove existing soil and replacing it with non-expansive soil for both new construction of foundation on expansive soil and repair work of slab on grade foundation. But sometimes structural slab provides an economical and safer solution than replacing existing expansive soil with non-expansive one.